Germany will host this week's G8 summit in Heiligendamm, a small Baltic Sea resort in the northern part of the country. The normally sleepy seaside resort has been transformed into a well-fortified stronghold. Leaders from the world's eight most industrialized nations -- the United States, Great Britain, Canada, France, Italy, Japan, Germany and Russia -- arrive today for three days of discussions on the world's most pressing problems, including climate change, proposals for aid to Africa and what to do about Iran's nuclear program, to name but a few. High on the agenda of German Chancellor Angela Merkel, who currently holds the rotating G8 chair, is global warming and developing a plan to cut greenhouse gases. She wants to see an agreement on binding emission reductions, cutting emissions in half by 2050. The United States is resisting such a proposal. In an interview with Der Spiegel magazine on what the magazine calls "the climate dispute," Merkel said, "I'm not expecting a solution this week. Our opinions have long differed about how to limit global warming. You can assume that I will not agree to allow any established scientific findings like the UN report on that topic to be watered down." In an open letter, environmental group Greenpeace called for Merkel to "take the lead in drastically cutting emissions and not to give in to U.S. President George W. Bush's suggestion to increase efforts to use new technologies and new bio-fuels instead." "The G8 countries account for over 80 percent of historic greenhouse gas emissions and continue to emit over 40 percent of CO2 emissions today. Per capita emissions in the G8 countries are among the highest in the world, led by the U.S., which emits around 20 tons of CO2 per person per year," Greenpeace climate policy expert Daniel Mittler told ABCNEWS.com. Merkel told Der Spiegel she believed an international agreement on global warming was crucial. "We Europeans are convinced that we should agree to international targets and to structure our measures accordingly. I believe that we can bundle these measures together under the auspices of the United Nations," Merkel told the magazine. Pledges for aid to Africa are also an important topic on the summit agenda, and Merkel is expected to push the participants to live up to the promises they made two years ago and be more generous toward the African continent. The growing international concern over Iran's nuclear program is expected to be discussed as well. "Iran will be a topic," Merkel said in the pre-summit interview with Der Spiegel magazine. "The actual negotiations will take place at the United Nations, but there will be preparatory discussions in Heiligendamm. We will talk about economic sanctions against Iran, but we will also talk about renewing the offers to talk." One topic, however, seems to be getting more attention than any other: security. Outside the wire-topped fence, which plows through the landscape for about 7.5 miles, cutting off the summit location Heiligendamm from the rest of the world, up to 100,000 protesters from all over the world are expected to stage dozens of anti-globalization, anti-capitalism demonstrations during the next couple of days. The protests began Saturday in the Baltic city of Rostock, about 15 miles away from the summit site at Heiligendamm. Tens of thousands of demonstrators marched through the harbor city, most of them peacefully. But the demonstration was marred by violence from a small but brutally violent group of stone-throwing anarchists battling with police. Almost 1,000 people, protesters and police were injured, when the so-called Black Bloc group of 2,000 anarchists transformed the city center into a battlefield, clashing with police in what some officials called "a brutality unknown until now." The violent clash brought the police's strategy of de-escalation to a rapid end. "I'm deeply disturbed by those riots and concerned that this violence by a minority has been able to overshadow the legitimate demonstrations of tens of thousands of peaceful protesters. We welcome all guests, and we want to encourage peaceful protesters to come here for peaceful demonstrations," Rostock's Lord Mayor Roland Methling told ABCNEWS.com. Werner Ratz, one of the organizers of the anti-G8 marches, has since apologized to the Rostock public. "We're truly sorry for what happened," Ratz said in an interview with German TV. "We really don't want anything to do with those rioters, but unfortunately there is no real concept how to keep them separated from the peaceful protesters." With world leaders arriving in northern Germany today, police are cutting no corners. About 16,000 police officers, most of them in riot gear, are now deployed to guarantee the safety of the G8 participants. 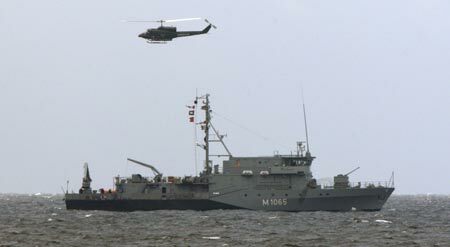 German and U.S. navies are patrolling the waters off shore. It's a very powerful show of force presenting the most elaborate security operation in Germany and, with the host nation spending about $135 million to pay for it, one of the costliest events ever. When asked what she expected of the G8 summit, Rostock resident Anita Rosenheim said, "I don't really expect much as far as concrete results are concerned, if anything." She's not alone: When asked by Sunday tabloid Bild am Sonntag what they expected the summit to produce, 73 percent of people said: "Nothing." Only 21 percent were quoted as saying they trusted something would come out of the summit, but they weren't really sure what that something would be.